"Kiana sat on her front porch steps and watched as the chicken across the street waved cars into the parking lot of the new 'Mr. Feathers Fried Chicken Franchise'. Kiana was totally mesmerized. 'That', she told herself', is what I absolutely must do when I grow up. I will have my own chicken suit and be a star and make lots and lots of money'. Kiana watched as the store manager, dressed in a crisp white apron, came across the parking lot and talked to the chicken. The day was blistering hot and the nice man had brought the chicken a large soda pop. The manager went back into the store and the chicken sat down on the curb. It took off it's yellow-billed head, looked at its watch, and wiped the perspiration off it's forehead. Kiana's chance to actually meet a star. She darted across the street, politely introduced herself to the chicken and sat down next to her on the curb. 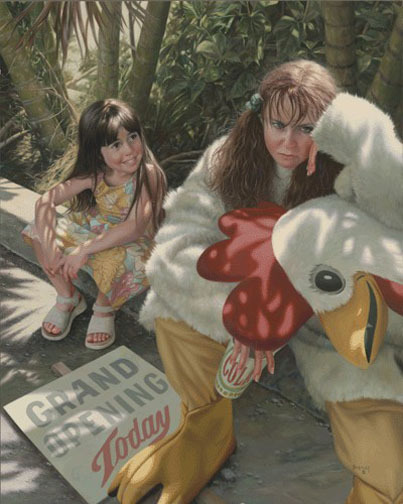 It didn't take Kiana long to discover that the chicken was less then ecstatic about her first day on the job. Actually the chicken didn't seem to want to chat much at all about how much fun it was having. After a few minutes of sitting in silence, Kiana had an idea. ‘What this chicken needed was a good 'Pep Talk' and Kiana knew at that moment, that she was just the one to deliver it."